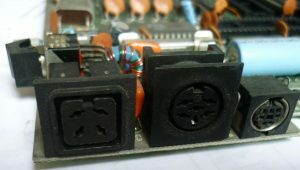 The Plus 4’s power connector is a square version of the C64’s and is annoying. 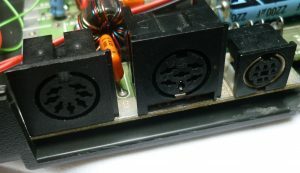 It’s more convenient to use a Vic 20 or C64 PSU as they are compatible and more readily available. Here’s how to make the necessary modification. 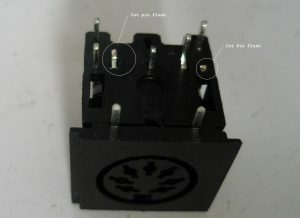 First buy a PCB mountable 7 pin DIN connector and cut the two pins shown. Ebay is a good place to buy. 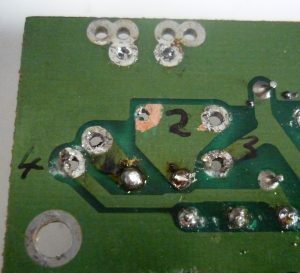 De-solder and remove square power connector. 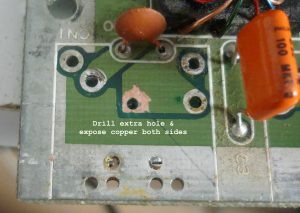 An extra hole needs to be drilled in the circuit board to accommodate the extra pin. 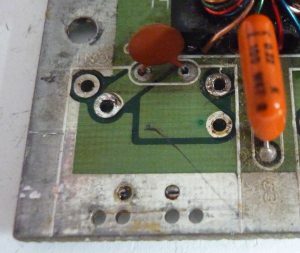 Mark the board by putting pencil lead on the end of extra pin and pressing it into the board. Once drilled make sure to remove some of the green solder mask. Solder new socket in place.